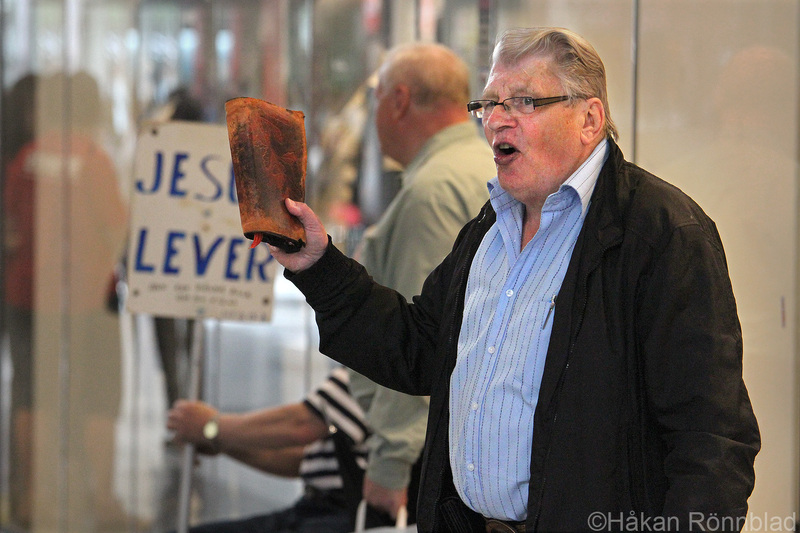 With a Billy Graham hairdo..
and swinging the holy book in a dramatic fashion this street preacher tried to fire up the visitors at the commercial center “Nordstan” in Gothenburg yesterday! Despite that the Billy look-alike refered to the tsunami in Japan, earthquakes and other plagues and somehow connected this as consequences of the lack of belief, he did not succeed to create a mass salvation amongst the busy shoppers! This entry was posted in photography, Sweden and tagged Billy Graham, Billy Graham hairdo, Femman, Gothenburg, hairdo, jesus, Nordstan, performance, photography, plagues, portraits, preacher, religion, Street photography, street preacher, the bible, the holy book, tsunami, tsunami in japan. Bookmark the permalink.